Firefighters in Lynn listened to Governor Charlie Baker at a bill signing at the Broadway Fire Station. LYNN — Flanked by firefighters and their families, Governor Charlie Baker formally signed legislation at Broadway Fire Station Tuesday afternoon that will designate cancer as a work-related injury for firefighters across Massachusetts. 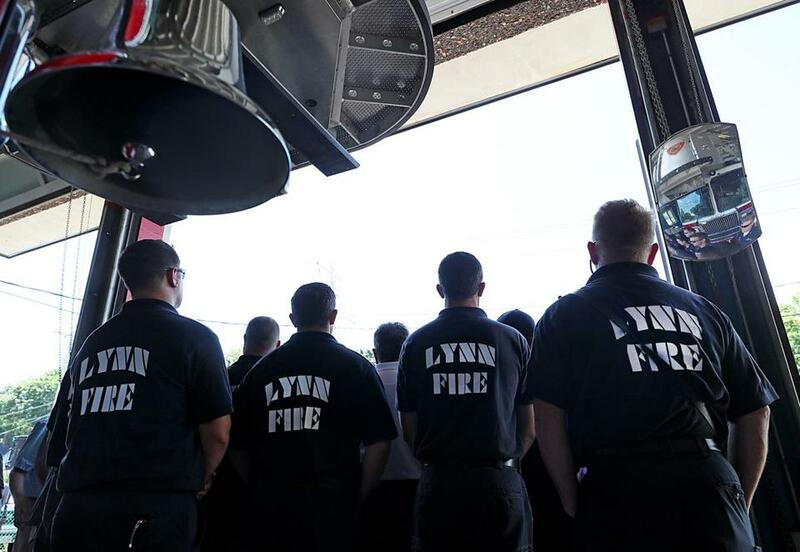 The new law — championed by State Representative Daniel Cahill, a Lynn Democrat — will cover all medical treatments for firefighters diagnosed with cancer as well as their time missed because of the illness. “Cancer is a very real hazard of the job, and we want to make sure we’re doing what we need to do to help those who serve,” Baker said during the press conference. Before the legislation, firefighters diagnosed with cancer were forced to use sick days and personal days while taking time off for treatment, general secretary-treasurer of the International Association of Fire Fighters Edward Kelly said. Richard MacKinnon, president of the Professional Firefighters of Massachusetts, said he and lawmakers talked to dozens of families affected by cancer related to firefighting, but one story in particular stuck out to him: that of Plymouth firefighter Anthony Colarusso, who died from esophageal cancer in 2015 at the age of 39 after losing his health insurance and receiving no paycheck for 93 days. Another provision of the law legislators touted is its inclusion of breast and reproductive cancers to protect female firefighters. “We realized that cancer knows no gender and we needed to have the same benefits for our increasing number of female firefighters across the state,” MacKinnon said. According to a press release, more than 300 active firefighters have been diagnosed with cancer since 2016. Of those diagnosed, 107 returned to work, 99 were forced to retire, and 29 died from the disease. A Center for Disease Control and Prevention study found that firefighters are 9 percent more likely to be diagnosed with cancer and 14 percent more likely to die from cancer than the general population.